And speaking of shoot-'em-ups, I'm sure most of you remember Microdeal's successful Goldrunner. Goldrunner's claim to fame was its stunning graphics and great scrolling effects. Now Microdeal has released Goldrunner II, and I like it even more than the original. 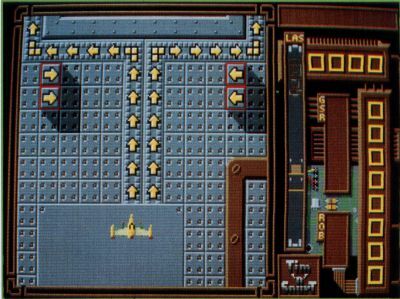 Fans of the old Goldrunner will find that the controls work similarly; so you'll be able to get right into Goldrunner II without a lot of practice. The game play is similar, too. Though the alien ships fire upon you, they can't get through your shield. The only way to get "killed" is for your ship to collide with one of the taller structures on the scrolling terrain. Even though the enemy's fire won't destroy your ship directly, getting hit applies a certain amount of force to your ship, causing it to move in the direction of the hit. If you get hit too many times, your ship will start moving so fast that you won't be able to avoid a crash. Fans of the old Goldrunner will find that the controls work similarly; so you'll be able to get right into Goldrunner II without a lot of practice. The game play is similar too. In Goldrunner II you must recover robots that have been stolen by space pirates. To accomplish this you must first blast a series of moving ground pods (called Transporter Cars), each of which contains a robot. Blasting a pod releases a robot, but you can't pick it up. You have to wait for one of the enemy recovery ships to pick up the robot, after which you must blast the ship and then grab the robot from the air before it disintegrates. Once you've gathered up a number of robots, you must drop them onto "teleport zones," where they will be teleported back to the Ring-Worlds of Triton. When all the robots have either been teleported or destroyed, you must then dock with the mother ship (a simple process), after which you'll advance to the next level. Every type of meanie, including Recovery Ships, Magnet Fighters, Magnet Mines, Noumenon Missiles and various types of fighters, will be doing their best to ruin your mission, making Goldrunner II a challenging and action-packed game. The graphics are marvelous and the game play addicting. Another fine feature is the availability of additional scenery disks. For $14.95 you can get a whole new world to explore and conquer. Recommendation: A must-buy for shoot-'em-up fans.